Fr. John A. Corapi submitted his resignation from the Society of Our Lady of the Most Holy Trinity (“SOLT”) early in June. SOLT is a Society of Apostolic Life of Diocesan Right with its regional office in Robstown, Texas. A woman, well known to Fr. John Corapi, mailed SOLT a signed letter detailing allegations of Fr. Corapi’s sexual activity with adult women, abuse of alcohol and drugs, improper sacramental practices, violation of his promise of poverty, and other wrongdoing. After receiving the allegation, SOLT formed a three person fact-finding team to ensure that it handled this matter in accordance with canonical norms. The team included a priest-canonist, a psychiatrist, and a lawyer. Two were members of religious orders, and one was a lay Catholic. Two were men, and one was a woman. All three have national reputations and substantial experience in ecclesiastical processes related to priest disciplinary issues. As the Society was engaging this team, Fr. Corapi filed a civil lawsuit against his principal accuser. He contended that she had defamed him and breached her contract. The contract, according to Corapi’s lawsuit, contained a provision binding the woman to silence about him. He offered the woman $100,000 to enter this agreement. SOLT’s fact-finding team subsequently learned that Fr. Corapi may have negotiated contracts with other key witnesses that precluded them from speaking with SOLT’s fact-finding team. Many of these witnesses likely had key information about the accusations being investigated and declined to answer questions and provide documents. He did have sexual relations and years of cohabitation (in California and Montana) with a woman known to him, when the relationship began, as a prostitute; He repeatedly abused alcohol and drugs; He has recently engaged in sexting activity with one or more women in Montana; He holds legal title to over $1 million in real estate, numerous luxury vehicles, motorcycles, an ATV, a boat dock, and several motor boats, which is a serious violation of his promise of poverty as a perpetually professed member of the Society. SOLT has contemporaneously with the issuance of this press release directed Fr. John Corapi, under obedience, to return home to the Society’s regional office and take up residence there. It has also ordered him, again under obedience, to dismiss the lawsuit he has filed against his accuser. SOLT’s prior direction to Fr. John Corapi not to engage in any preaching or teaching, the celebration of the sacraments or other public ministry continues. Catholics should understand that SOLT does not consider Fr. John Corapi as fit for ministry. N.B. : The post previously occupying this spot has been removed until the statement it contained can be verified. I received this information just seconds after publishing my article “Should Priests Live in Community? Reflections Inspired by the Case of Father Corapi,” in which I mentioned that I had received a copy of Father Corapi’s lawsuit last week, detailing the allegations that his accuser had made. Father Sheehan’s statement about the illicit activities that Father Corapi engaged in is consistent with the allegations listed in the lawsuit. Some people are suggesting the SOLT statement isn’t real. I have it on good authority that it has been verified otherwise the Reg would not have run it. It is legit. SOLT says he did it all. More commentary to come. Still trying to take it in. UPDATE III: Fr Corapi responds to the above. Its principle ‘religious’ exports today are thinkers who despise religion. From Richard Dawkins, who has compared religion to child abuse, to my friend Christopher Hitchens, who titled his 2007 book God Is Not Great: How Religion Poisons Everything, the British have cornered the market on being anti-God – at least the Christian and Jewish varieties. While 92 percent of Americans believe in God, in Britain only 35% do and, according to Britain’s National Center for Social Research, 43% say they have no religion. The percentage of those affiliated with the Church of England dropped from 40% in 1983 to 23% in 2009. A really good job it is! … This is quite a remarkable performance. Never mind the strategy; witness the fervour and the conviction. The Sensible Bond via Fr Z (HT). Anglican Charity Gives £1 Million to the Ordinariate! The Charity Commission has been asked to investigate a £1 million grant made to the Ordinariate, a new Roman Catholic organisation for defecting Anglicans, by a 150-year-old Anglican charity. Trustees of the Confraternity of the Blessed Sacrament, founded in 1862 as part of the High Church revival in the Church of England, voted the grant through a few weeks ago, thus divesting their charity of more than half its total assets of £1.85 million. The grant has prompted an outcry among Anglo-Catholics who have remained in the Church of England. It’s an exclusive but the whole piece is behind that greedmonger Murdoch’s accursed paywall experiment in the Times (which I thought would have failed by now). In any event, I’m sure some puckish subscriber (or hacker) will ‘copy and paste’ the whole article sooner rather than later. I don’t at this point know what it says in full, but it rather seems to me like a good investment made by some faithful Anglicans – albeit to a Church out of their own. The letter from the Superior-General of the Confraternity of the Blessed Sacrament announcing the donation can be read here. 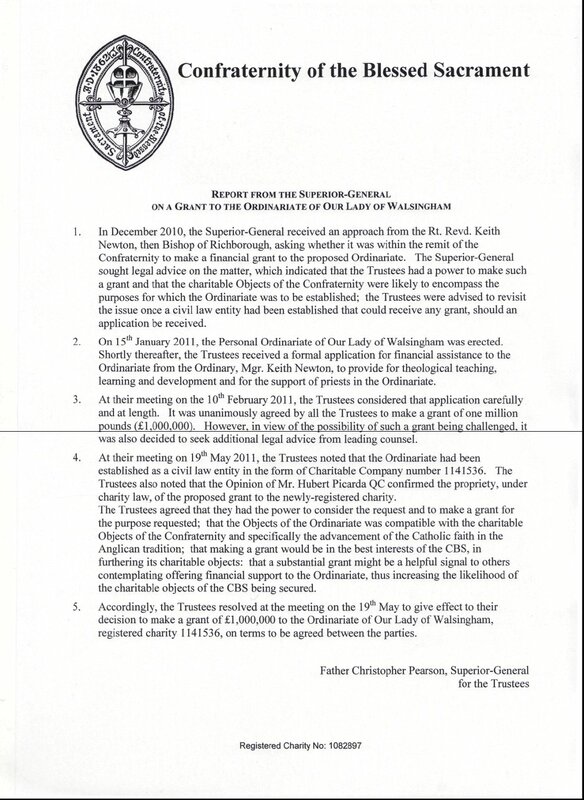 … the Trustees resolved at the meeting on the 19th May to give effect to their decision to make a grant of £1,000,000 to the Ordinariate of Our Lady of Walsingham, registered charity 1141536, on terms to be agreed between the parties. Seems like the Biblioblog library is up and running… and this blog is there! You can check out the entire list of Biblioblogs and Related Blogs here.